Hanukkah, or Chanukah, begins on the 25th day of the Jewish calendar month of Kislev, at sundown. Lasting eight days, Hanukkah usually occurs during December, but sometimes begins in November. This Jewish holiday is known as the Festival of Lights, commemorating the rededication of the Temple in Jerusalem in 164 B.C. after three years of war. Hanukkah means "dedication." Jerusalem at the time was part of the Hellenistic empire and was ruled by Antiochus IV. His government instituted a different religion from Judaism. When the Temple became a site of sacrifices and icons, the people resisted, sparking three years of fierce rebellion. The Maccabees led the rebellion and were triumphant in 164 B.C. When they returned to Temple, they found that the Lamp of Eternal Light was gone. A simple menorah was constructed, but they could only find a small cruse of oil. With only enough oil to light the lamp for one night, the Maccabees sent for more oil to be prepared. Miraculously, the oil lasted eight nights until more oil could be delivered. 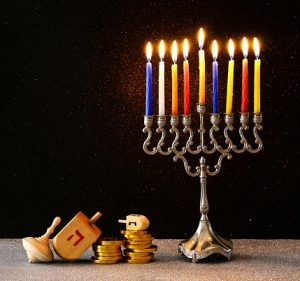 Hanukkah is celebrated over eight evenings and includes a symbolic lighting of the menorah each evening. Families have many traditions for this holiday, including family gatherings, meals, games, and the exchange of gifts. Visit the library to find out more. Happy Hanukkah! Find out about the history of Chanukkah and traditions like the lighting of the menorah. Recipes, games and a Chanukah how-to. Includes audio and video of prayers, talks, and choir performances.